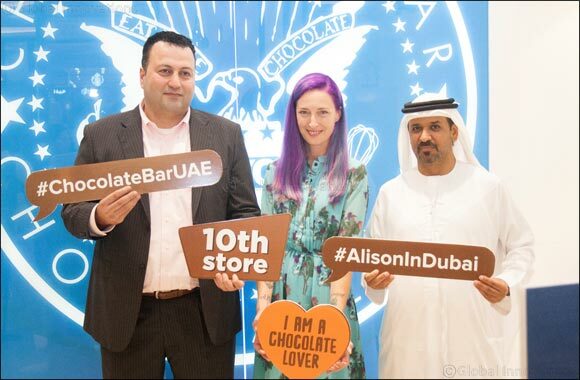 Dubai, United Arab Emirates, November 14, 2015: Alison Nelson, the creator of New York’s most popular chocolate store, flew to Dubai to celebrate the much-anticipated opening of Chocolate Bar’s tenth branch at Mall of the Emirates. During her visit, Alison hosted a special lunch at the new outlet, revealing the history of Chocolate Bar and the inspiration behind the creation the dedicated menu for this region. “I am honored to be in Dubai to celebrate this milestone. Opening ten outlets in such short time was a big challenge for both Mr. Saif Belhasa, the franchise owner, and me. Their support to make Chocolate Bar one of the most popular cafés in the UAE is immeasurable”, said Alison Nelson. Mr. Saif Belhasa, Chairman of Saif Belhasa Holding, added: “It has been a remarkable journey so far for Chocolate Bar in this market. However, we strongly believe that what sets us apart is the excellence in everything we offer to our guests at Chocolate Bar: food, service, and ambiance”. Alison Nelson’s Chocolate Bar is part of Crème De La Crème, the hospitality division and a member of the Saif Belhasa Holding Company. With over 200,000 guests every month, it offers a stylized and affordable full service chocolate café and dessert shop for the entire family. Due to its popularity and consumers’ demand, Crème de la crème plans to open additional outlets in 2016. “We have big plans for next year, opening four more branches being among them. We will choose the best locations, and Palm Jumeirah is one of shortlisted premises. Even the F&B sector in the UAE is very competitive, we have one of the best market share, and we will put all our efforts to keep Alison Nelson’s Chocolate Bar at the top”, said Wessam Eldin Shehata, General manager of Crème de la crème. Alison Nelson founded Chocolate Bar in 2002, having regular guests celebrities like Sarah Jessica Parker, Gwyneth Paltrow, Julia Roberts, Scarlett Johanson, Jake Gyllenhal, Leonardo DiCaprio and Uma Thurman. Nelson launched Chocolate Bar with an initial investment of $75,000. Two years later, she was named one of Gourmet News Magazine’s influential “20 under 40,” and by 2007 she won Inc Magazine’s award for one of the “Fastest Growing Private Companies in America”. Other accolades include Timeout New York’s “Best Chocolate Store” and Wallpaper Magazine’s “Favorite Stores Around the World” to name a few.